Google Analytics is one of my favourite free internet marketing tools. You’ve got it going on your site right? (If not, check out my basic overview of Google Analytics to learn about all the goodies it can offer your small business). One very important part of your set up is blocking your own computer from your website stats. You probably visit your website a bazillion times and you certainly don’t need your own activity to mess up your insights. You want to know what everyone else is doing on your site! Now it’s time to set up your filter to block your computer from being counted in your analytics data. By default, the “Predefined filter” is already selected and this is what you need. The first drop down is good to go to as we want to “Exclude.” For the 2nd drop down, choose “traffic from the IP addresses“. This will change the field below to IP address. Leave the “that are equal to” field selected. Now you just need to fill in the numbers that correspond to your computer. 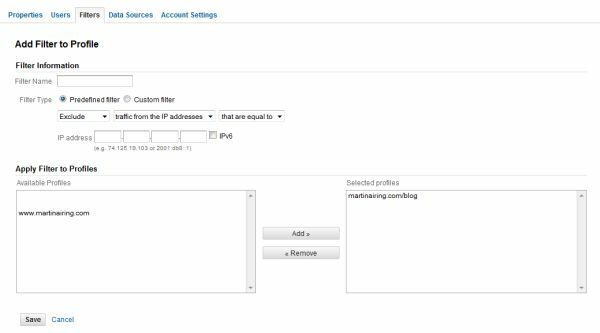 Not sure how to find your IP address? Some good instructions can be found here for Windows and here for Mac. Now you need to choose which website you want to apply this to. If you are managing several sites, they will all show up here. If you just manage one website, you still do need to add it. Simply click it so that it’s highlighted and click “add” – it will now be listed under “Selected Profiles“. To finish up, click “Save“. And there you have it! Now your Google Analytics will no longer include all the (countless :)) times you visit your website in your web stats. You can add as many filters as you need to. So if you use a few different computers, make sure to get them all in there. And don’t forget your staff or assistants! You don’t need to be counting them either. Note: IPv6 is a new format for IP addresses and is quite long and contains colons (:) instead of periods (.). Unless you’ve got a brand spanking new computer or device, you probably don’t have this format. Previous post: Successfully pitch a guest blog post idea and it’ll be a home run!